These sandblasted HDU street name signs are mounted from our wrought iron hangers and a 4x4 wood post-see Product Line 4 for more hanger and post designs Shown on the left is a round post and rectangular steel frames; on the right is a square post and a sign with a decorative scroll bar. 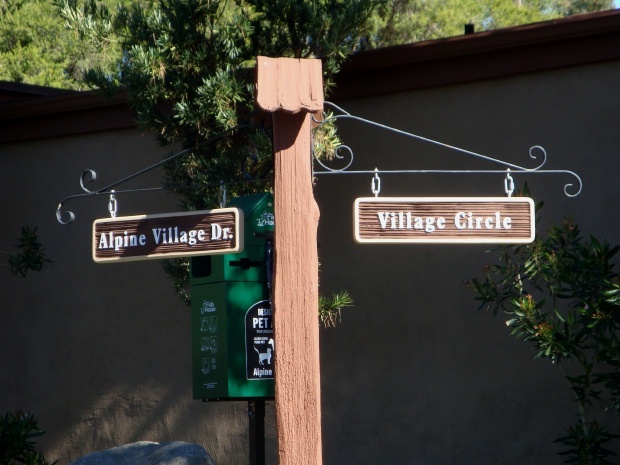 Our street and traffic signs can be mounted on our round aluminum posts in several ways, as shown here. These dimensional street name signs are carved from HDU, a foam design with a hard fiberglass epoxy resin coating for longevity and protection against damage. To see many photos and designs of street, traffic and parking signs, click on "Return to List" below right..To see other Photo Gallery pages, click on one of the numbered blue boxes on the left hand side of this page.